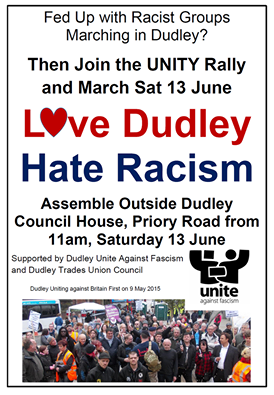 This Saturday 13th in Dudley there is an attempt to launch a new right-wing street movement. The awkwardly-named All Football Fans/Firms March Against Islamisation (AFFFMAI) appears to be an attempt to copy the emergence last year of the German HoGeSa (Hooligans Against Salafism), which itself was copying the EDL. It seems unlikely that this will ‘break the mould’ of the far-right and far more likely that it will be all the same old faces under a different banner. However, the people of Dudley are fed up with the far-right parading through their town, stirring up hatred and racism. Already this year Dudley has been targetted by the EDL and Britain First. This is now the third far-right demo in the town since February. All of the various rival far-right outfits are attempting to exploit the issue of a new mosque due to be built in the town. 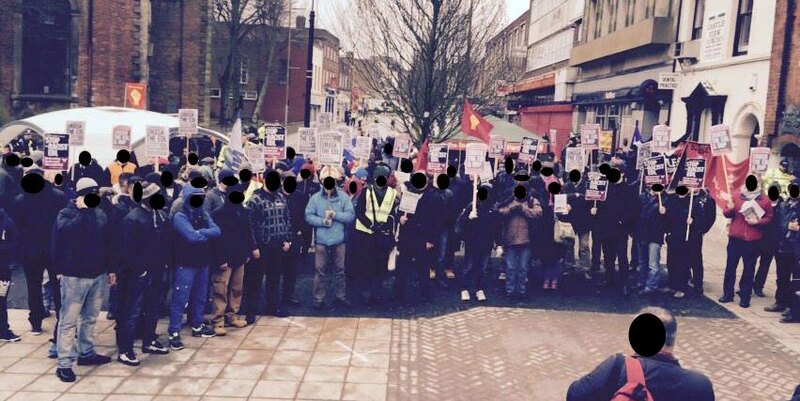 There is an opposing anti-fascist rally and march organised by UAF/Love Dudley Hate Racism. This is assembling at the Council House at 10.30am and will be over before the AFFFMAI march in the afternoon. AFFFMAI members will muster on Stafford Street car park from 12-1 and they will march at 1pm along The Inhedge, Parsons Street and Ednam Road to Coronation Gardens where they will hold a gathering which is expected to last until around 3.30pm. Dudley has been the scene of some of the far-right’s worst racist violence – during previous demos they have attacked people on the street as well as property, homes, cars, businesses and both the Hindu temple and the mosque. The far-right have repeatedly threatened to burn down the new mosque. This in the context of a string of bomb attacks on mosques in the Midlands. On the University of Birmingham campus, there has been an ongoing issue with fascist graffiti such as swastikas sprayed along with the message “Islam must die”. Two years ago in Birmingham, 82-year old Mohammed Saleem was stabbed to death by a far-right fanatic.